Do you need it? Harvest with a purpose or plan in mind, not just for the fun of it. Harvest only as much as you will use and process it as soon as possible (don’t waste it). 1 in 20 rule. It is ok to harvest a plant if there are 20 others available to maintain the population. Leave Grandmother. Allow the biggest and best plants to remain so they can continue to propagate the healthiest population. Harvest with a caretaker attitude so the plant or tree or patch or forest can continue to survive and thrive. Make sure you have permission from the land owner(s) and abide by the law. Offer appreciation and bring positive energy to your harvest. Never put anything in your mouth unless you are 100% sure it is safe to ingest. 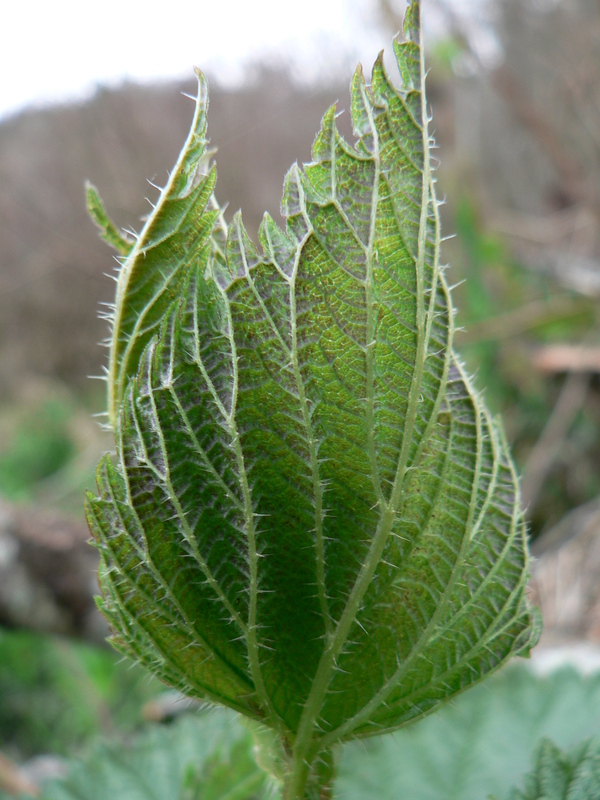 Here you can see the characteristic heart shape and serrate edges of a stinging nettle leaf. Fortunately stinging nettle has a distinctive look to it. You’ll notice the first leaves emerging from snow or soil in late January (in the Pacific Northwest). The leaves and stem are vibrant green and pubescent (hairy), sometimes with a hint of purple. 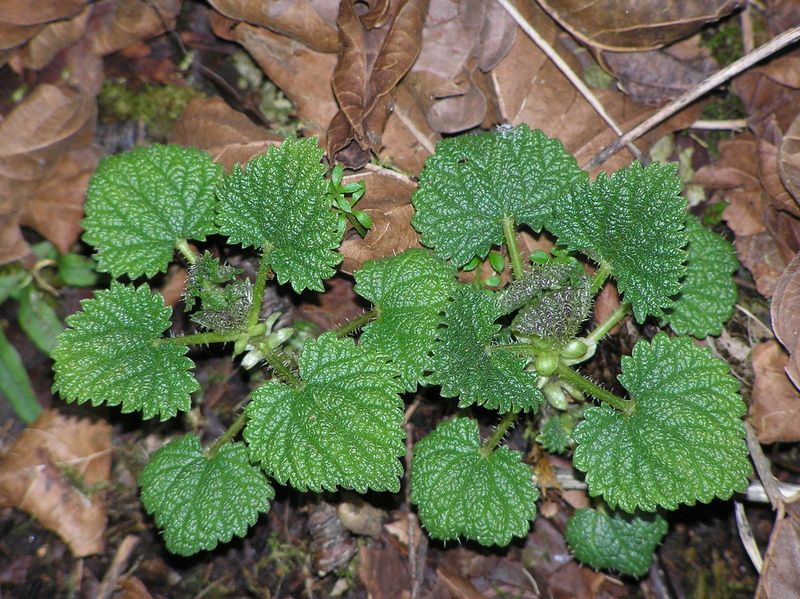 As the nettle grows, the strongly serrate/toothed margins or edges of the leaves become more evident. Each leaf has a twin on the opposite side of the erect central stem and they’re arranged such that one pair is in the 12 and 6 o’clock positions. The next set down is slightly larger and is at 3 and 9 o’clock. The next set down is even larger and back at 12 and 6 o’clock, and so on. The leaves have a characteristic heart shape to them with a small stem attaching the cleft or top of the heart to the central stem. The base or point of the heart aims away from the central stem. By late spring, the nettles are 3 to 6+ feet high, the largest leaves are upwards of 7 inches long and they are flowering lovely whitish/greenish inflorescences or clusters. These clusters will soon go to seed and become slightly brown. And as late summer turns to autumn, the leaves will wither and fall and the stems will turn from green to brown to whitish/gray as they overwinter. The bare stalks may decompose completely before new leaves emerge from the underground rhizomes or they may remain to oversee the beginning of the next generation of foliage. 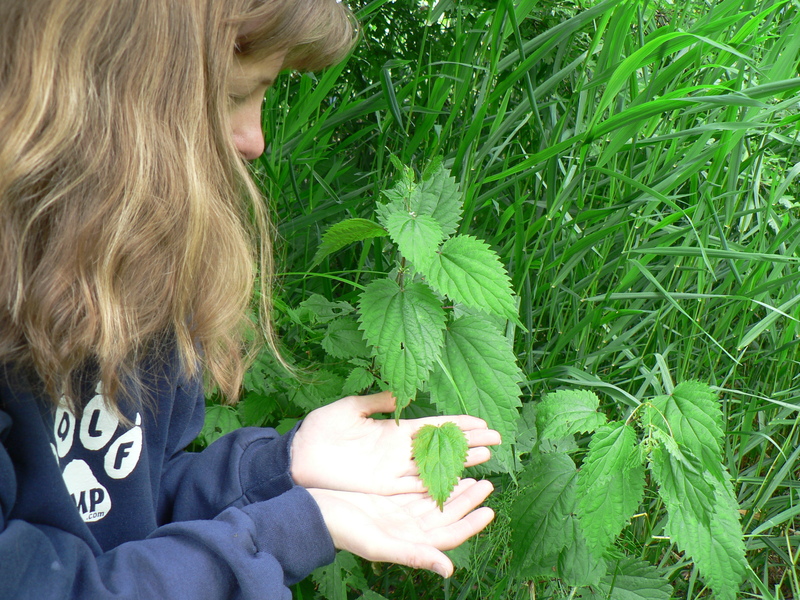 If you are still unsure whether a plant is indeed a stinging nettle, you can opt to touch it and see what happens. If you feel a sting and a small welt arises, then you have confirmation of the plant’s identity. If not, then perhaps you could consult a field guide such as Plants of the Pacific Northwest Coast by Pojar and MacKinnon (the best field guide, bar none, for this region). When do I harvest Stinging Nettle? These young nettles emerged in late January here in Washington. At this size, I harvest the tops and throw them into a stir fry. You may harvest nettles from the time the new leaves emerge from the ground until late fall after the flowers have gone to seed but before the rains begin to rot the stems (while they still maintain their green color and have leaves attached). It all depends upon your goal. If you would like to use nettles for food or tea, then harvest them before they flower. Some believe that at this stage the nettles form cystoliths or calcium concretions (aka bladder stones) that are bad for the urinary tract. You can find many online sources that say nettles at that stage are bad for the kidneys. I’ve not personally found scientific evidence that nettles are harmful after flowering and I don’t want to spread mistruths. Alternately, I don’t want to offer advice that could do harm. So I shall err on the side of caution and recommend that you harvest prior to flowering until reliable and replicatable evidence to the contrary becomes available. This stinging nettle is starting to flower and will soon go to seed. 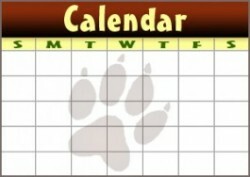 Do not harvest for food or medicine during or after this stage except in emergencies. Fortunately, individual plants will often be at different reproductive stages depending on their location, substrate, overstory, etc. So, look around and you can usually find some that are harvestable where others are not. I like to harvest nettles for rope-making after they’ve gone to seed (this allows for propagation) and prior to heavy rains that will cause the stems to rot. How do I harvest Stinging Nettle without getting stung? The easy answer is to use scissors and wear long sleeves, long pants and work gloves. But it’s much more interesting to harvest nettles when you understand how the stinging process works and learn how to handle (and even eat!) them sans gloves without getting stung. When looking at a stinging nettle, you can see little hairs on the stem and leaves. These hairs are hollow and when they get under your skin, the tips break off and allow the formic acid (among other things) under your skin. Now I don’t know if every hair is hollow or if every hollow hair has acid associated with it. I do know that sometimes the lightest touch will get you stung and sometimes it takes effort to get stung. The key is that the hairs on the leaves all aim from the cleft or top of the leaf to the point or bottom of the leaf. If you run your finger from cleft to point, you will not get stung and you will impress your friends. If you run your finger from the pointy end up toward the cleft and central stem, chances are excellent you will get stung. It’s as simple as that. 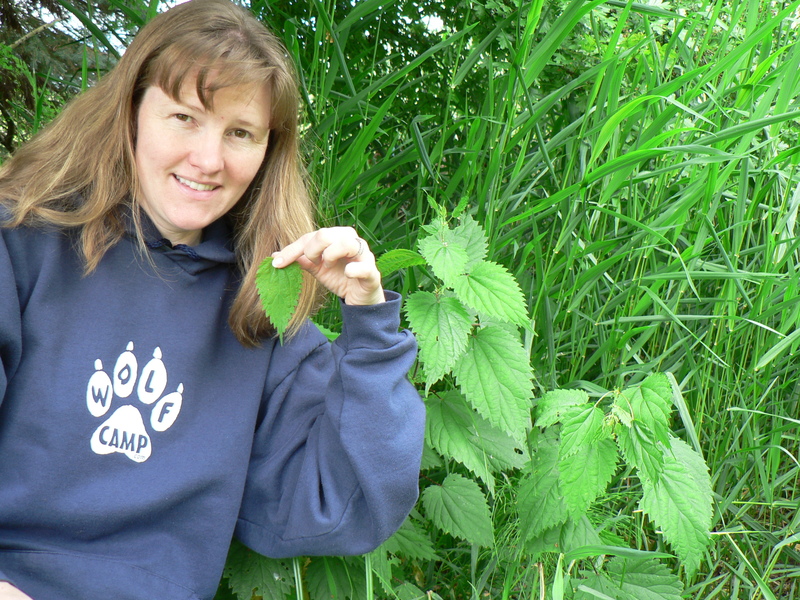 Wolf Camp and the Wolf College co-owner and lead instructor, Kim Chisholm, demonstrates how to safely harvest stinging nettle leaves without gloves. Let’s imagine you wish to harvest some nettles, and you have your scissors but forgot your gloves. No problem, you say, because you know the secret (or you pull your sleeves down over your fingers). All you to do is cut the portion you need, hover your fingers above and below the leaf, then pinch it. Voila, no sting, because you know the hairs don’t point straight out, they angle down the leaf. All you’ve done is press them flat against the leaf where they cannot poke you. Good job! Now you can place the nettle in your collecting bag and continue harvesting. If you’ve forgotten your scissors, you can harvest leaf by leaf (but that takes a long time). If you choose to go this route, be extra careful. When you select your leaf and pinch it, look at the location of the nearby leaves before you pull it from the stem. Beware the smaller upper leaves that dangle down and zap the top of your hand. And be mindful of the larger lower leaves that sneak out and get you on the wrist as you’re watching out for the wily upper leaves. Stinging nettle is a plant that demands respect and I honor it. What part do I harvest? I harvest the tender tops (usually 4-6 leaves or 2-3 leaf sets) for food. There are a number of species of moth and butterfly larvae that feed on nettles. Check the terminal (top) bud for signs of an inhabitant before harvesting. It just takes a quick glance to notice that the tip has been chewed, is slightly blackened or there is frass (waste material from plant-eating insects) visible. If the nettles are very young then I only harvest the top bud and first leaf set. Harvesting the terminal (top) bud will stimulate lateral bud growth causing the plant to become more bushy and allowing you to harvest continually from the same plant. For fiber, harvest the entire stem. Clip it near the ground. If you’re wearing gloves, grasp the base in one hand and run your other hand from base to tip in order to strip off the leaves. I strip it where I harvest it and allow the leaves to remain, decompose and provide nutrients to the soil from whence they came. How do I process Stinging Nettle for food? Give critters a chance to escape from freshly harvested nettles prior to processing or storing. When I return home with my harvest, I’ll decide whether to use them right away or store them for later use. If using them right away, I’ll often lay them out on a clean surface or in a colander for a few minutes to allow critters a moment to escape. Then I run them under cold tap water to rinse away any dirt or debris and give them a last look before processing. If you’re not concerned about a little dirt or extra protein, then they’re fine to use as is. Please do not put them directly into a salad or you and your guests will be in for an unpleasant surprise. I recommend handling them with gloves or tongs at this point, though you can choose to do it without. Freshly harvested nettle will store in a bag in the vegetable drawer of your refrigerator, unwashed, for at least 2-3 days (probably longer). When you’re ready for them, just pull them out, rinse if you wish and go for it! Dry your nettles and use them to make a delicious and nutritious teas. 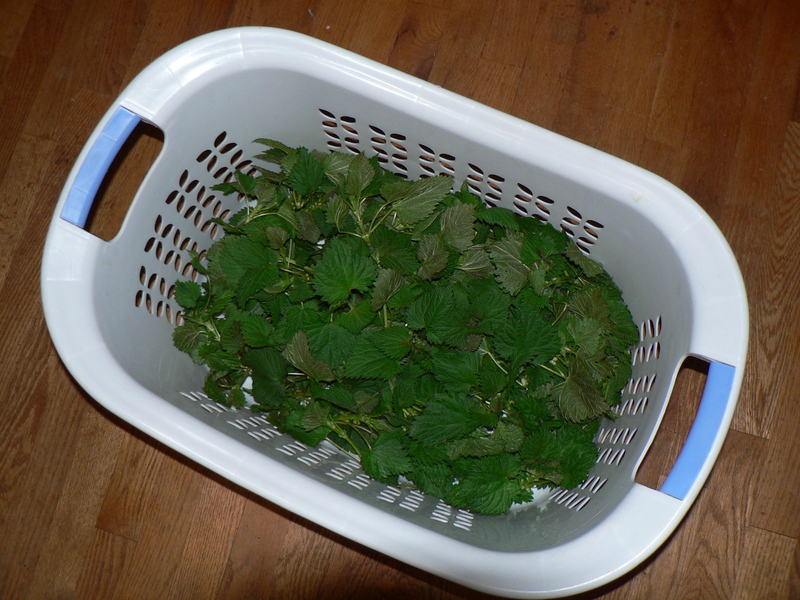 If you would like to dry your nettles for tea, there are many options. I put mine in a paper bag or cardboard box in front of my furnace and let the warm, blowing air do the job. Resist the urge to reach in and stir them up because they can still sting you while they’re moist. Once they’re dry, they are much safer to handle since they lose the ability to sting. However, the hairs are still there and can be irritating to the skin or give you a sliver if you’re not careful. You can tell they are ready to store in a glass jar when the stems snap. Make sure not to dry them to the point where they lose their green color and turn brown or black. You can also hang them to dry, use a dehydrator or be creative with your method. 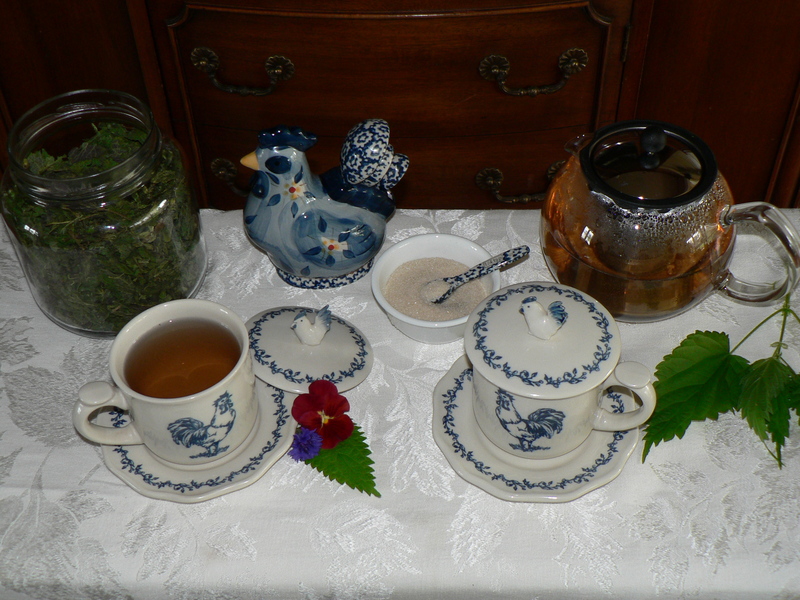 It’s just fine to use fresh plant material to make tea, I just prefer the taste of dried nettle. I run fresh nettles through a food processor, then freeze them to store. Sometimes I like to freeze my nettles for use throughout the year. I toss them, raw, into my food processor and process until finely chopped. Then I put them into freezer-safe containers and store until I need them. The mechanical action of the food processor will break the hollow hairs so they are unable to sting you. Some people recommend blanching the nettles (adding them to boiling water, plunging into ice water, then using). I prefer to store and use them raw because many of the nutrients I want to ingest are lost to the water and thrown out when blanching. Experiment and you will find a way that works best for you and your family. What kinds of foods can I make with Stinging Nettle? Steam stinging nettle on top of your veggie stir fry or mix in as you would spinach. Stinging nettle can substitute for spinach in any cooked recipe (they lose their sting when cooked). You can add them to lasagna, make pasta with them, throw them in soups or stews, etc. Online recipes abound. My favorite ways to eat nettles are: a simple saute, steamed on top of sauteed veggies or a raw pesto. To make the saute, melt a little butter, Smart Balance or heat your oil of choice in a skillet. Toss in your nettles (I leave the stems on if tender, or I saute with tough stems and cut them off prior to serving), saute until crisp (your first time), add salt and pepper to taste, then enjoy. Cooking the nettles will neutralize the sting, but the hairs are still visible. This can be rather alarming when eating them for the first few times. That’s why I recommend cooking until crisp – so you feel a little more confident. You can vary the time/tenderness in the future to suit your individual preference. 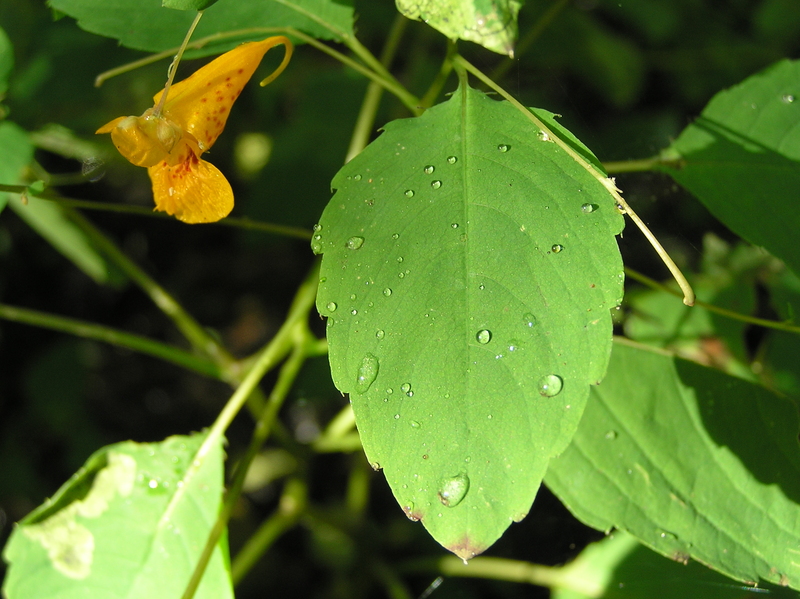 Jewelweed is one of the many potential natural remedies for a stinging nettle sting. It works for me every time! Place the first 5 ingredients into your food processor and turn it on or pulse. Slowly add olive oil until it reaches your desired consistency. Serve with crackers, chopped vegetables or on pasta. The pesto will turn dark on top as the plant material is exposed to air (like a cut apple turning brown), but this doesn’t impact the flavor. To minimize this, you can add a thin layer of olive oil on top if your pesto is in your serving dish, increase the amount of lemon juice in your recipe (keep taste-testing to make sure it’s not too much), continue to stir it so the dark part mixes in, or serve promptly. Refrigerate any un-used portion. Also, I recommend consuming your pesto the day you make it. I find that the flavor becomes too powerful if it sits overnight. 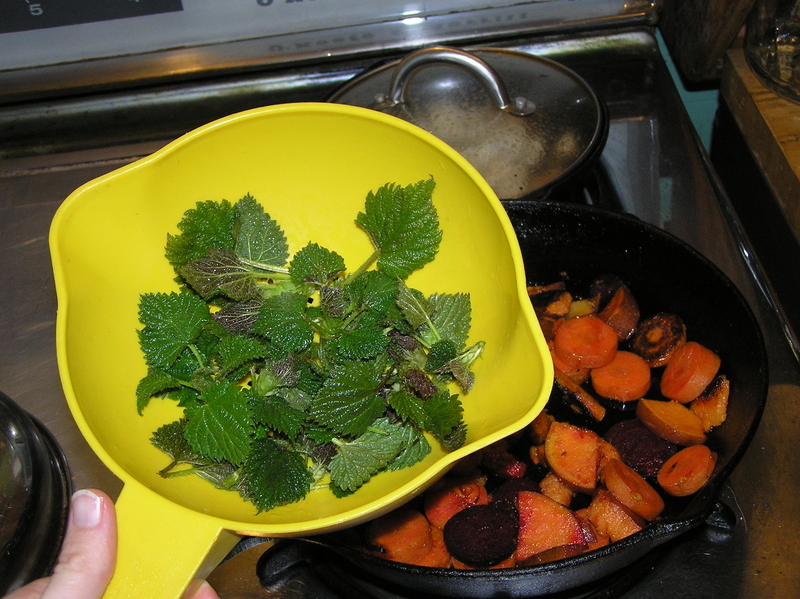 You can substitute basil for a portion of the nettle but it will tend to overpower the flavor. This recipe is a Wolf College favorite! What do I do if I get stung by a Stinging Nettle? Getting stung is a bit of a bummer but not a very big deal. And, it’s certainly not enough of a negative to keep me from harvesting and enjoying these amazing plants. I rarely get stung (unless I’m showing others what it’s like) but when I do there are a few natural remedies nearby that I like to use. You’ll find that different remedies work for different people, so you may have to try a few to find what works for you. My brother swears that mud does the trick for him. Doesn’t do a thing for me except get me dirty. My #1 go-to plant to stop the sting is Jewelweed. Simply crush a leaf, rub it on and the sting is eliminated. Some people make a spit poultice out of Common (Broad-Leaf) or Lance-Leaf Plantain. Others crush and apply Yellow Dock leaves or rub the welt/sting with the spores on the under side of Sword Fern leaves. And, if you’re so inclined, you can smash some of the stems with a rock and apply the juice from the plant that stung you or from it’s roots. I’m not sure of the efficacy of that idea, since I think an alkaline compound would be needed to counteract the acidic nature of nettle stings. If you’re close to home, you can apply aloe vera gel, make and apply a paste of baking soda and water, apple cider vinegar, Desitin (diaper rash cream), tooth paste, etc. 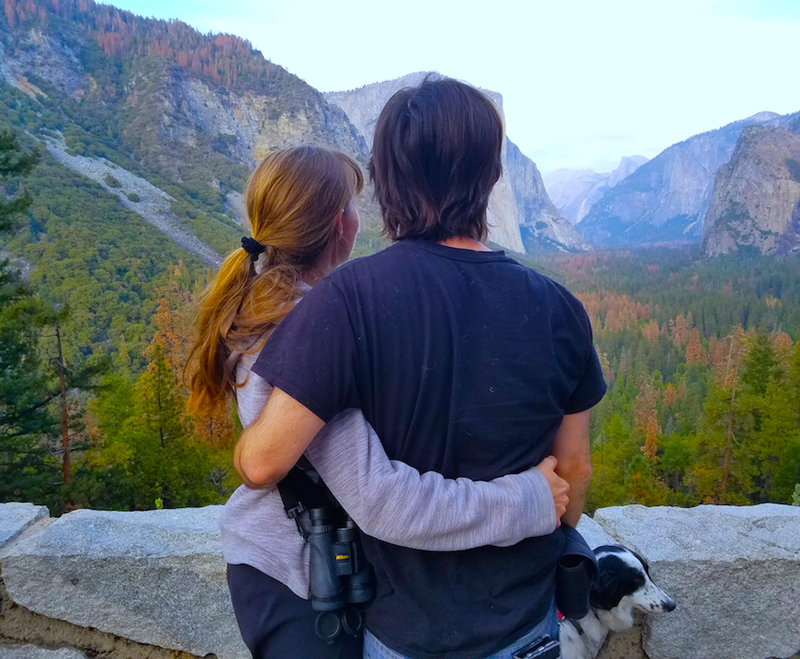 I encourage you not only to research (field guide or online) the plant remedies listed above, but go outside and look around to make sure you can identify them in the field where you’ll actually be when you need them. 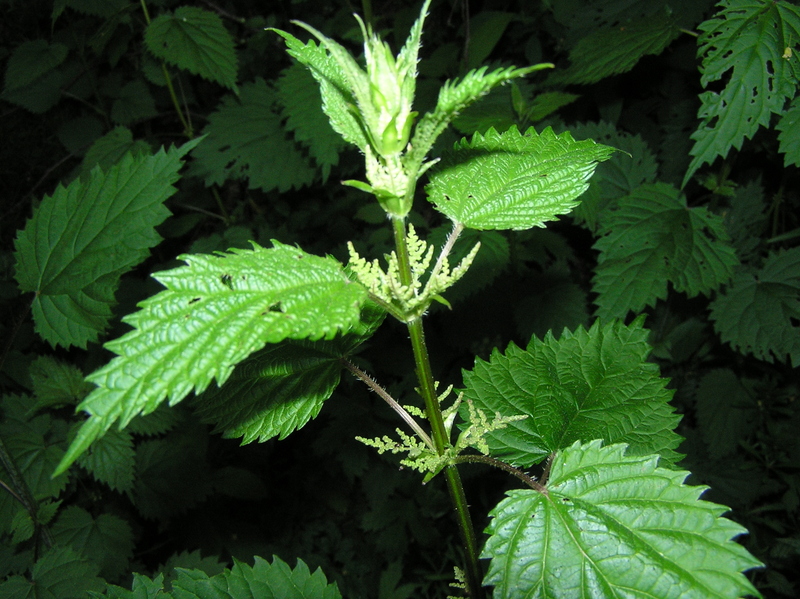 The internet boasts many medicinal uses for stinging nettle which may or may not be true. I encourage you to do your research well by finding reputable and independent sources of information. Consider working with a respected herbalist or naturopathic physician in your area – someone who uses plants as medicine on a regular basis and knows from experience what they will and will not do. Stinging nettles have the strongest natural plant fiber in this region (Western Washington) and are very easy to process into rope. I’ll be doing a post on this in the fall (when I harvest for fiber), so watch for that. Yes, you can eat a leaf raw, freshly harvested from the plant. It must be done in such a way as to break the hollow hairs or else they can sting you in the mouth. You can find videos online that show you how to do this. 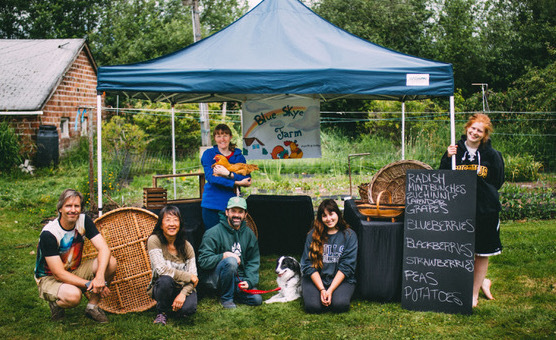 Or, come to one of our plant classes, workshops, camps or expeditions where we’ll demonstrate then invite you to give it a try. Some of the nettles in my area come early fall have gone to seed and their stalks have fallen over, only to have new growth shoots emerge from the woody stem. Is this new growth okay to harvest for food before it too starts to flower? Or since it is emerging from a nettle plant that has previously flowered should it be considered past the stage for eating? Thanks! Hi Eric. We have not seen any study to test whether the harsh post-flowering compounds are still present in the new fall growth. Personally, we do harvest them anyway for periodic (maybe monthly) fresh meals throughout the year, but not for consistent eating, and definitely not for drying/preserving as daily tea, for instance. We only use the spring growth for intensive or daily use. So I was pulling weeds. This one felt like needles. Still hurts. Tried different stuff. Finally Grabbed some toothpaste. This helped abit. Took a Picture of this Stinging Nettle. Trying to identify this Stinging weed. Reading you can eat it. 😳😳. What. Make tea. I. Not enjoying this Stinging right now. Good toothpaste idea! We always tell our students that the nutritious acids in the nettle hairs are literally like lemon juice – stings if they accidentally get into a cut / under the skin, but very nutritious and tasty to eat. I live in San Pedro near Port of Los angles and just noticed stinging g nettles pop up last year. Thinking it was because of a really wet wi term for us I was surprised when the nettles returned this year with a vengeance, after a year of record drought. Now that I have learned that they’re edible and quite nutritious I plan to cook years, and don’t remember ever seeing stinging nettles. I grew stinging nettles for the first time this year in my garden. I cooked some up and I was surprised at how much I liked the flavor. My first thought was it’s better than spinach. I’ll make nettle tea next. Despite the stinging dangers, the plant is definitely a keeper. Does your nettle pesto sting when you eat it? 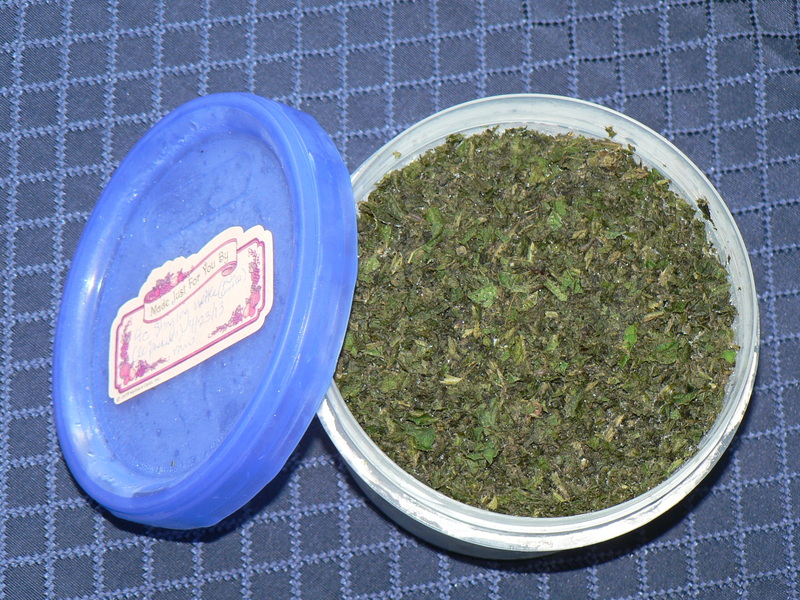 Can eating your nettle pesto cause throat irritation? Blending up the nettles for pesto causes the hairs to be cut up, so they can’t sting, but if you don’t blanch the nettles in advance, the pesto will become very acidic (so irritating on the throat) after a few hours in the fridge, so eat it soon after making it if not blanched. If planning to store and eat the following day, then blanch your nettles before blending into the pesto. I have been used to finding nettles for many years, but not eating them. I do like to eat other “weed” items, so I will be trying it out. I was wondering if the “Flower” bud is good to eat before it goes dry and seeds out? I found some on the Nettles, and they are little-rounded ovals with points on the ends. Two I picked to check out had a leaf coming right out of the base of the pod. Also, I heard tell from another post the root of the nettle when dried makes good tea? I am not sure of it, so I can’t say for certain. I do like Dandelion leaves washed and fried like spinach, sometimes mixing them with spinach. There is also a “Sour Dock” plant I have had when younger, that works well with Dandelion leaves. Are you familiar with this plant? (Sour Dock is what I was told it was from a Southern Fellow). Hi Russell. Sorry for the delayed response. I love eating the flowers and seeds, but have never found research on their effects on the body, so can’t comment on their safety. Same with nettle root, although if a person harvested and dried enough nettle leaves during springtime, that’s really the way to go for tea. As for Sour Dock, the problem with common names is different people use different names for different plants, but it’s probably Curly Dock, or Rumex crispus, and I’ve learned from my most trusted herbalist teacher that it is excellent for digestive health, like Dandelion, but since all these plants do have medicinal qualities, should be eaten in moderation with an eye out for research as to any side effects. Hi there.. I drink stinging nettle tea every night after dinner… I love the taste.. I had an issue with blood sugar but the tea is helping me a lot! Your article is very good! I live north of Seattle and nettles grow every where! For 20 years I wacked them with a stick..
Hi Anna. Thanks for the follow-up phone call, and as mentioned, fresh leaves are normally available in the spring at some farmer’s markets. Otherwise, just order some seeds from https://www.mountainroseherbs.com/products/nettle-seeds/profile and plant them in a big pot, placed on the south side of your house during the winter, and north side in late spring and summer. However, as described in the article, remember that the leaves should not be eaten after the plant starts flowering. Wishing you the best!